Tuesday – 4:30 am – I’m awake. And alone on the boat – Goldwin is still in CA. I hear the patter of rain on the hatch above me. I pull on a rain jacket and climb outside to pull the cockpit cushions up under the shelter of the sunshade. The bad weather isn’t expected until late evening. But it’s starting early. Soon the rain comes in earnest – a deluge. Huge drops, then sheets of water. It’s a white-out. For 20 minutes. The wind starts to howl – 25 mph; then the rig shudders – gusts to 30 mph. 9:00 am Back in the boat I put on a nice top and an old pair of shorts, then pack my wallet, camera, hairbrush and some nice pants in a waterproof bag, don my foul weather jacket and hat, and dinghy into the rain to the Sailing Club dock. I’m the only boat there. 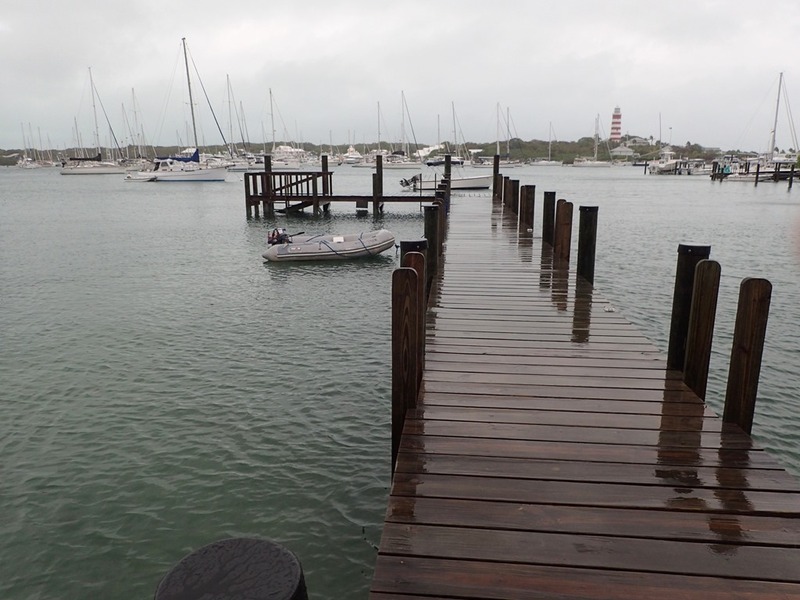 I throw out the stern anchor and tie up the boat, then walk to the Post Office dock to stand in the rain and wait – with other similarly plastic-encased women – for a shuttle or golf cart to the Abaco Inn, mid-island. The golf carts are also soaking wet and not enclosed. We arrive; I exchange my wet pants for dry ones and make an effort with my hair. 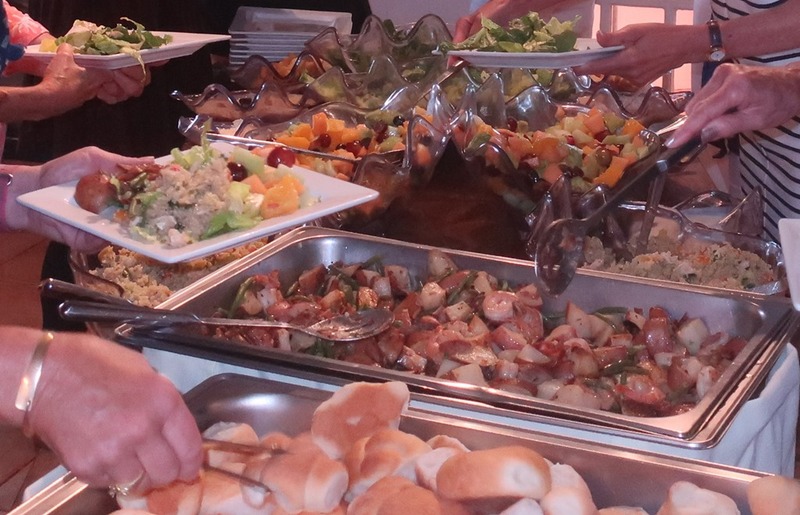 We have a lovely lunch sponsored by a group called Cay Topics. Today we are listening to five local women share their stories of coming to the Bahamas from the US, falling in love, marrying, and raising their families and building their careers here. Fun, and lunch is amazing, with crème brulee for dessert. 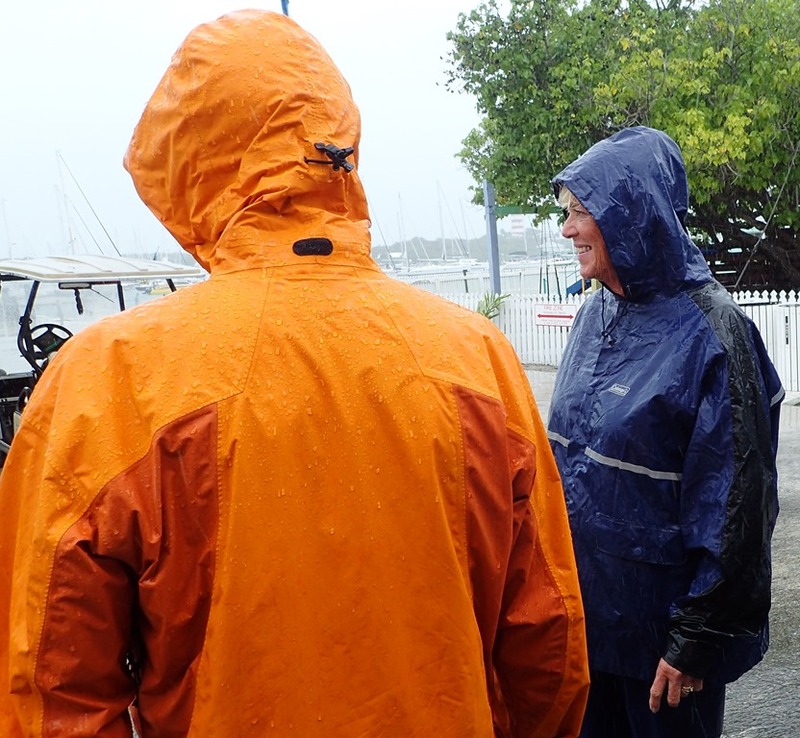 Then it’s back out into the drenching rain in our still wet rain gear to ride in the still wet golf carts and, for me, my still wet dinghy back to the boat. Water is dripping off my jacket and pants onto the floor of the boat. The whole boat feels wet. 3:00 pm The wind starts to howl again. 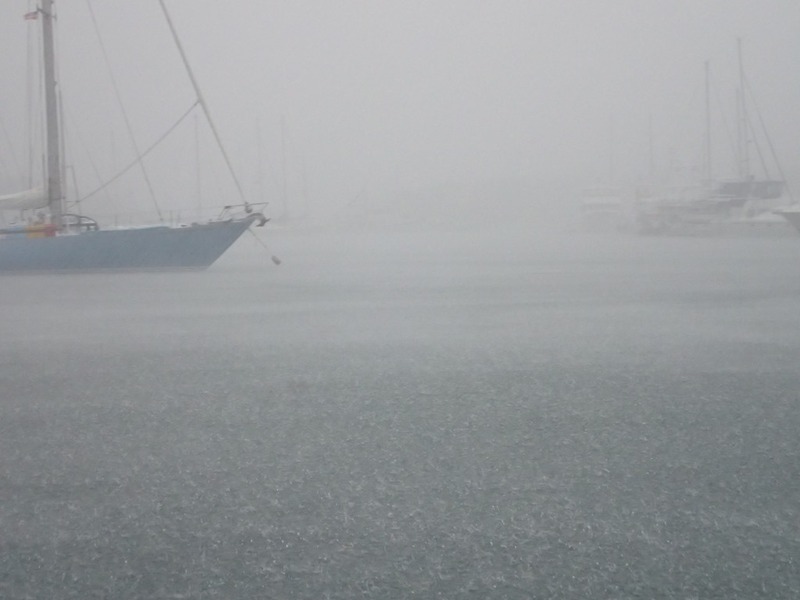 I go on deck, working my way forward in driving rain, leaning hard against the wind, gusting to 25 as the boat bucks and sways on its mooring. I add some ties to the boom cover to keep it from blowing off; add detergent to the mooring lines to keep them from squeaking, and remove the sunshade so it won’t whip itself to shreds. 4:00 pm I’m again running the engine – to power the fridge and toast some homemade bread. I slather it with New Zealand butter and woof it down even though I’ve had a huge lunch. 6:00 pm The dampness makes 67 degrees feel cold; I sit in the boat, wearing a blanket. But the predicted evening wind never materializes. I finally fall asleep and stay asleep. The morning dawns bright, warm and DRY. Goldwin arrives on the 12:15 pm ferry. We celebrate with lunch at Cap’n Jack’s: conch fritters, fish sandwiches and Kalik beer. 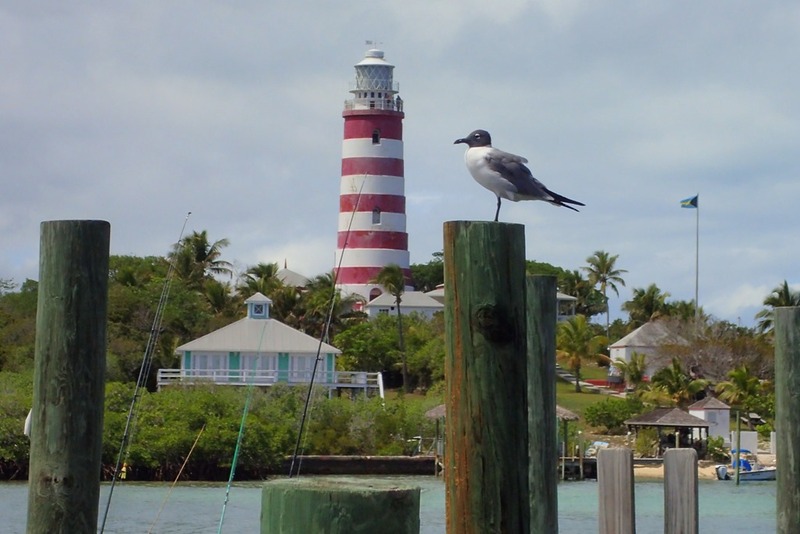 In the shadow of the lighthouse – and this laughing gull (its real name). OMG you’re my S/HERO! You can do anything and with a smile on your face the next day like it was just another day. 😊I hope one day you write a book and I’ll be your first customer. 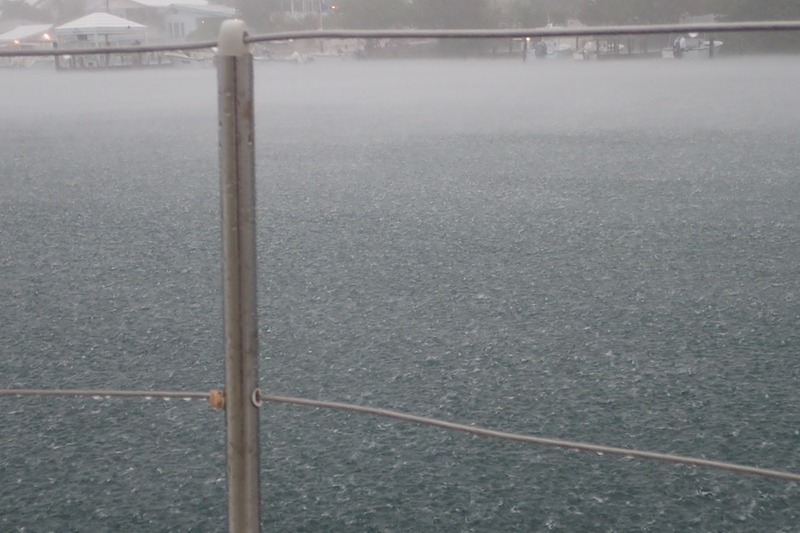 Nice story – and yes when it rains it seems everything on the boat is wet or at least damp! We have had more than a week of rainy weather in Sydney and today it is sunny! Just found your daughter’s YouTube channel and then found your web page. My wife and I are beginning to sail and are looking for a boat. Your video convinced me that we don’t need a big one. Thanks. Just retired and sail Lake Michigan. Would be nice to find a Camper Nicholson around here but doubt it!! So glad you’re enjoying the blogs. Our daughter’s was amazing. BTW, I grew up in SW MI – used to hang out at Holland State Park in the summer.